Taiwanese smartphone manufacturer Alcatel has launched four new smartphones in India, which will compete in the mid to high-end segments. Three of those devices will belong to the budget Idol series, while the fourth will be a 6-inch high-end phablet called the One Touch Hero. The three budget models launched by Alcatel – Idol X, Idol S and Idol Mini – will feature screens ranging in size from 5 to 4.3-inches. Starting prices for the Idol series will be as low as Rs 10,000, and each of the three devices will be available in multiple variants with storage options of 4GB, 8GB and 16GB. While the Idol S features 4G connectivity, the Idol X will feature a fast quad-core processor. The cheapest of the lot, the Idol Mini will have the smallest display and will come packing a low-powered processor. All three devices come with thin bezels – measuring just 2.4 mm – which makes for slimmer and lighter devices. Alcatel is positioning the One Touch Hero in the premium end of the smartphone market, and is priced at Rs 30,000. Similar to the most popular phablet, the Samsung Galaxy Note series, the Hero features a Stylus that allows user to draw and write on the screen. The device also gets a similar split-screen function in order to work on two apps at once. The device sports a FullHD (1920x1080 pixel) screen and is powered by a 1.5GHz quad-core processor, coupled to 2GB of RAM. Internal storage memory stands at 16GB but is expandable up to a maximum of 32GB via a microSD card. The device however runs on a rather outdated version of Google's Android mobile OS – 4.2 Jelly Bean. The One Touch Hero also houses a 13MP primary camera at the rear and a 2MP front facing shooter. Rounding up the spec sheet is a large 3,400mAh battery that should hopefully be good for a full days use. 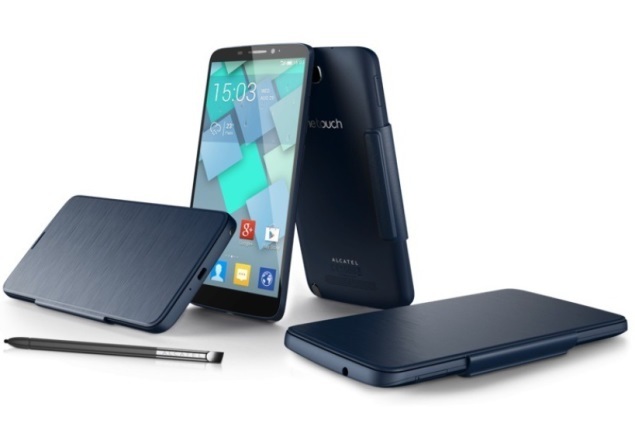 Alcatel added that both its Idol series of phones and the One Touch Hero will be available through physical and online retail stores. The company has ditched its online-only method of sale, as it had opted for with the launch of its Idol X+, which sold exclusively through Flipkart.